There are no bike paths at all in this part of Auckland. Not one. Most of my route is along a very busy and very main road which gets lots of trucks, buses and vans as well as many, many cars. So I opted to ride on the footpath the whole way. I think this is probably illegal but if my flouting of the law helps to bring attention to the glaring absence of safe cycle paths, then it’s worth it. I also stuck this sign to the back of my bike. Victor gave me the idea. The message I want to convey with this sign is that I want to ride my bike. Me riding my bike is good for me, good for Auckland and good for New Zealand. 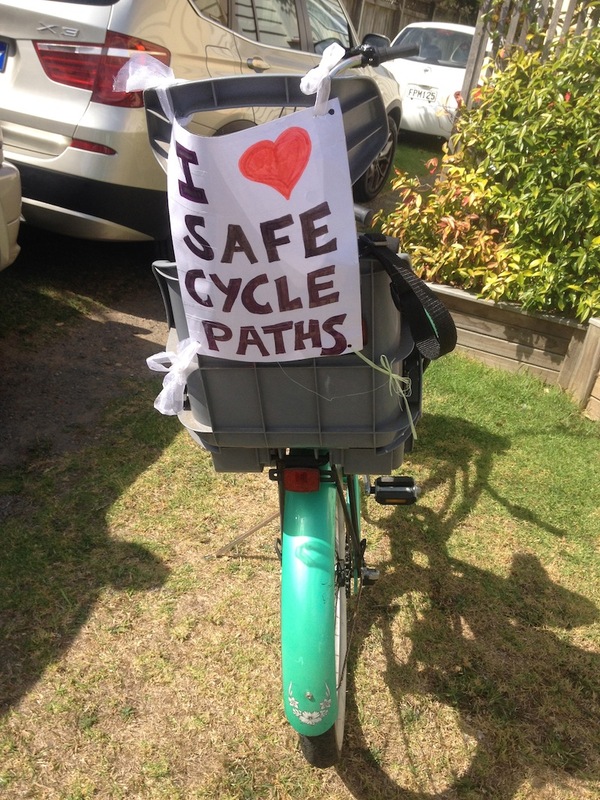 I want to be safe and in order to be safe, I need cycle paths. Therefore Auckland needs cycle paths. Posted in Auckland, Cycling and tagged Auckland, bike, commuting, cycle paths, cycling. Bookmark the permalink. So relieved you chose to ride on the footpath, Rachel – much too risky otherwise. I see a few Mums here (in Sydney) who ride on the footpaths and I’m pleased they don’t chance it on the roads especially with little ones on board. There is a lot of agression towards cyclists here. That aggression towards cyclists is present in New Zealand as well although I haven’t seen it personally, thank goodness. I think that motorists who kill cyclists should be charged with manslaughter. Interesting seeing this from the other side of the world – we Brits have the impression that the Australians and New Zealanders are outdoor living types, so very disappointing to hear about te aggression towards cyclists. Funny you should say this Denise. Once when I was cycling around York, I got stopped by sustrans as they were conducting a survey and looking for ways to improve the cycle network. When I told them I was from New Zealand, they immediately assumed cycling was terrific in New Zealand. I told them the truth which is that it’s diabolical and possibly the worst country in the developed world for cycling. I’ve lived in a few places and I’m yet to find somewhere worse for cycling than Auckland (although I’m sure they do exist). Rachel – Good for you. The sign was a clever idea. You mention that you thought you might be flouting the law. I can’t imagine that a cop would insist on your riding in the midst of heavy traffic with Elizabeth in tow. Surely…. Thanks, Bronwyn. I would be very surprised if we got stopped by the cops so hopefully not. I’m probably more likely to get abusive comments from pedestrians who think I should be on the road but I’m quite careful when I pass pedestrians and go very slowly and cycle around them so hopefully this won’t happen. Being Auckland too, there aren’t all that many pedestrians anyway. Better buy an expensive bike. People who cannot afford cars are suspicious and may be arrested any time. Don’t tell Anthony Watts about my activist advice. He already has such a bad impression of climate scientists. Victor, A sign on my bike is tame! I could do something much more controversial to draw attention to my cause 🙂 but I probably won’t and if I do, I won’t blame you. So you needn’t worry. PS Love your header photo, is it new or am I late to the party as usual? The header is fairly new. I’ve only had it up there for about a week. It was a photo I took when we went to Aberdeen and is of the Cairngorms. Something for me to look forward to. I too wonder whether anyone has noticed my sign. I hope so.